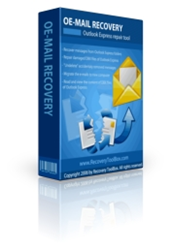 Recovery Toolbox, an established developer of compact and efficient data recovery tools, announces the availability of a deeply updated and optimized version of OE-Mail Recovery, the ultimate Outlook Express recovery tool that is easy enough to be accessible for all categories of users. The program features a brand-new data analysis core and improved algorithms for smooth, fast and comprehensive recovery from badly damaged DBX files. the ultimate Outlook Express recovery tool that is easy enough to be accessible for all categories of users. Extracted messages are saved in the *.eml format, which is used by the majority of email applications. The installation file of this Outlook Express recovery tool has a compact size, and the program does not require any additional components or libraries to be downloaded and installed. OE-Mail Recovery is a must-have utility for all users looking for a reliable method of restoring the contents of their DBX/DBT files without resorting to third-party services. “We are proud to be offering the most efficient and comprehensive Outlook Express recovery tool on today’s market, now with an even faster core and the same convenient interface that users of its previous versions have consistently praised,” commented Victor Bobrov, Head of Product Development at Recovery Toolbox.